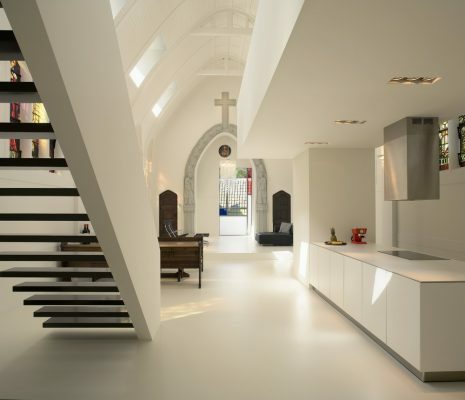 An old Catholic church is transformed into one spatial residence. 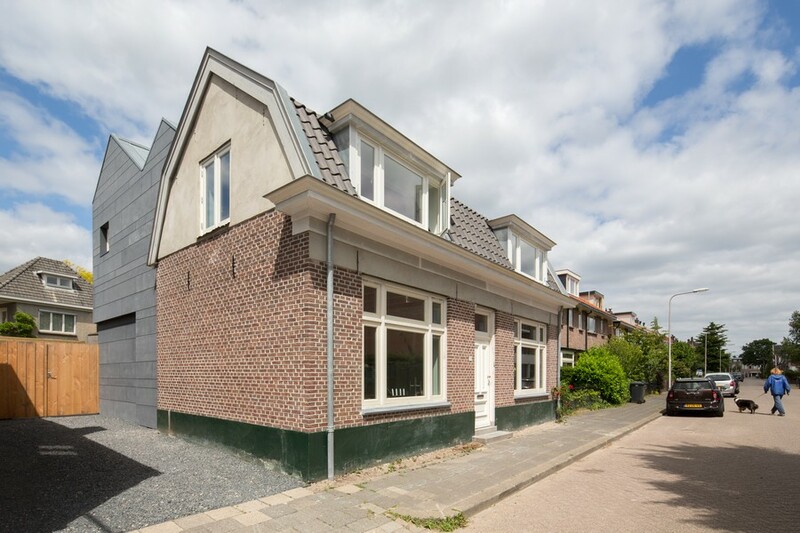 The character of the small church is retaind and where possible reinforced. The colours of the characteristic leaded glass are brought to life by brightening the complete space. 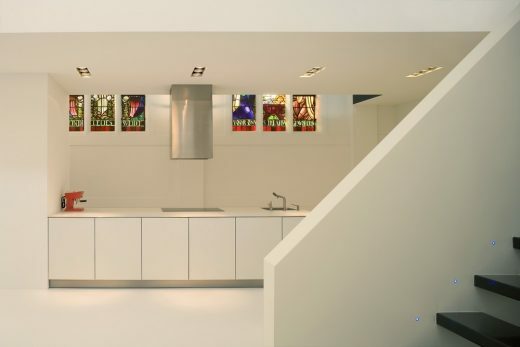 The stained glass works as a projector on the clear surfaces. 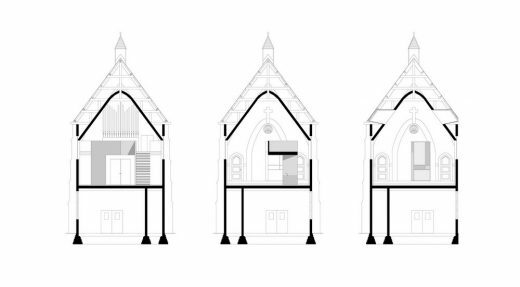 For extra daylight roof windows are added, through which diffused light enters the converted chapel. 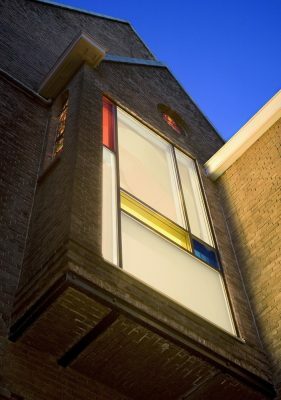 To create contact with the city a large Mondriaan-like window is added behind the original altar. It’s an abstract version of the leaded glass with its strong colours. The balcony with its beautiful organ is extended in the shape of an organizing element. This sculpture defines the different spaces in the chapel: living, dining, cooking and studying on top of it. New spatial hierarchy is created by the asymmetric placing of this organizing element. 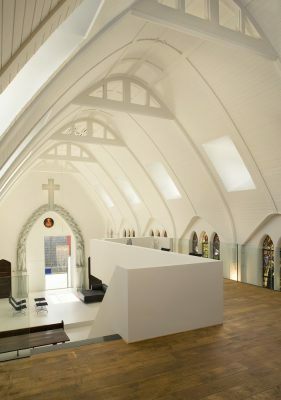 It’s kept minimalistic and given abstract shapes, by which it intensifies the contrast with the original soft shapes of the chapel. Some original furniture is reused in the new atmosphere, like the church benches in the dining zone. Also the table is made out of church benches. 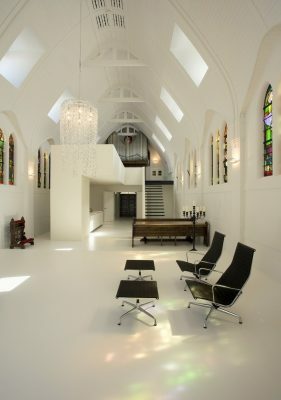 In contrast with the daytime-chapel-space, the bedroom is made extremely dark with clear white sanitary.